This story, by Ray Werner, originally appeared in the Summer 2014 Recorder. 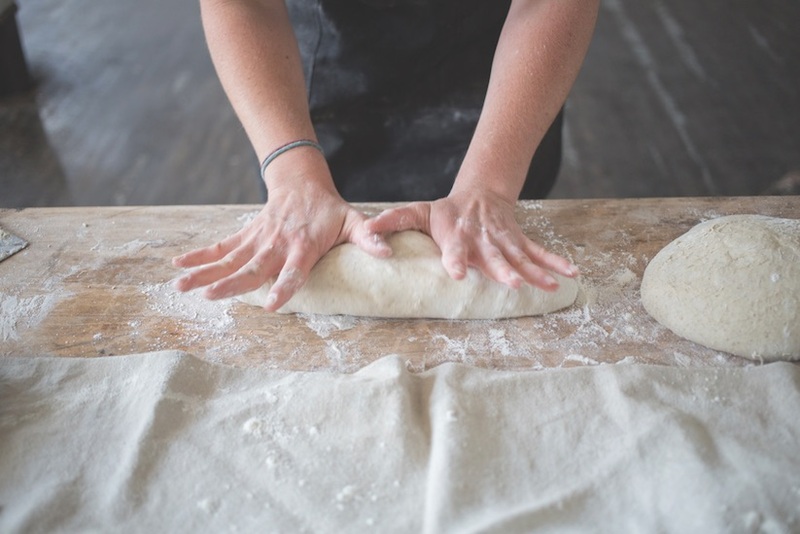 Catch the 61B bus from Regent Square to Braddock and you just might catch a whiff of pungent-sweet sourdough bread, on its way to a brick oven. Benjamin Franklin would approve. You recall he was seen with a loaf of bread under each arm as he strolled along Market Street in Philadelphia. No doubt Ben’s bread was also baked in a brick oven similar to one run by Chatham University student Shauna Kearns. A student in the Falk School of Sustainability’s Master of Arts in Food Studies (MAFS) program, Shauna has a ready smile and her eyes light up like arctic stars at the mere mention of bread. On her lap is a plastic container of several pounds of sourdough rising to the occasion and ready to be baked in Braddock’s community brick oven. It’s a trip she makes two or three days a week. While she shapes her bread, she is also helping to shape the new community spirit that is a catalyst behind all the good things happening in this comeback town. Their newest community brick oven will be built this July next to the new and much anticipated Superior Motors restaurant. That love landed her an apprenticeship at Tracebridge Sourdough in England. Shauna brought a jar of Tracebridge sourdough starter back to Toronto from the UK, which she still uses for her bread. Then, she apprenticed at St. John’s Bakery, a nonprofit next to a mission that trains the unemployed. This will be the model for the bread-baking training program Shauna plans for Braddock. These past few summers, Shauna has also led canoe trips on the Ravensthroat and Coppermine Rivers in the Arctic, and she’s going back this summer, along with her sourdough starter, to paddle the Keele. Yes, she bakes bread in the Arctic wilderness. Much like the Klondike miners did during the gold rush in the late 19th century. But Shauna mines a different kind of gold. Shauna received one of the initial Falk Sustainability Summer Fellowships, which will help her participate this summer in an oven-building workshop at Touchstone Center for Crafts in Farmington, Pennsylvania, and to serve as an apprentice at their oven- use workshop in September. 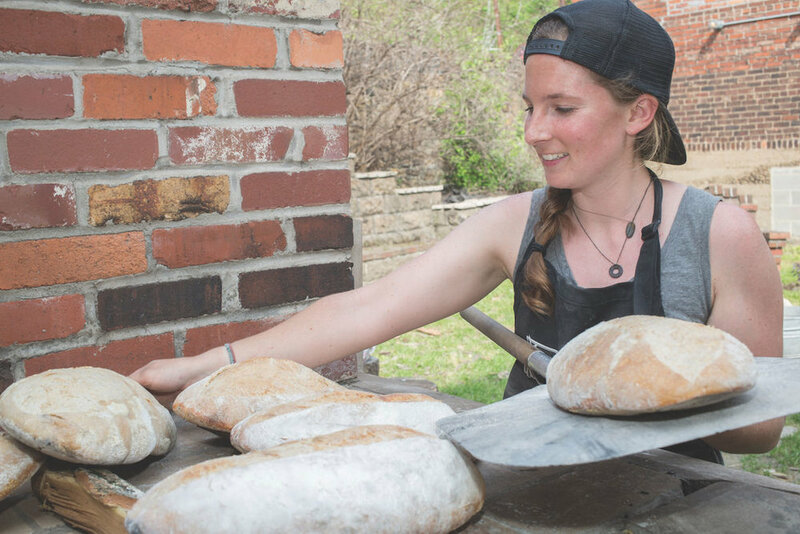 For Shauna, it’s all about what bread from a brick oven can do to bring people together – to learn, to share, to develop a skill and give something back to the community. So, while breaking bread, Shauna is also breaking the mold. What comes out of the community oven in Braddock is extraordinary. But what comes out of her community spirit is changing people’s lives. Under Shauna's leadership, Chatham will be building a community bread oven at Eden Hall Campus in the summer of 2017. In spring and summer 2017, Chatham will be hosting food-related workshops--including bread baking with Shauna--at Eden Hall. Chatham’s Master of Arts in Food Studies in the Falk School of Sustainability & Environment emphasizes a holistic approach to food systems, from agriculture and food production to cuisines and consumption, providing intellectual and practical experience from field to table.